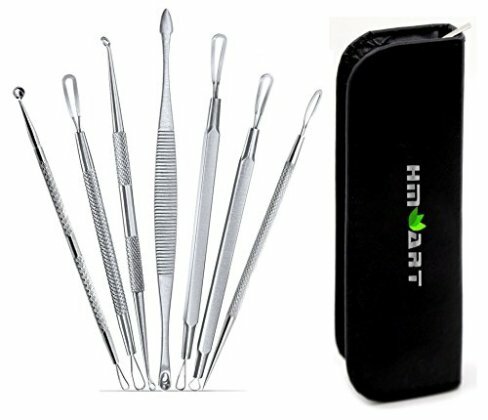 Pimple and Blackhead Remover Tool Kit includes 7 Professional Quality Tools made from Stainless Steel. It is designed for pimple popping, blackhead removal, blemish extraction, zits, whiteheads, and comedones. Please don't forget to be safe and sterilize the tools before each use. Kit comes in a sleek looking case! The travel size case fits perfectly in your purse, bag, or even your pocket. The case straps each tool securely in place so you won't lose them. Don't settle for generic tools out there on the market that will RUST after your first usage! Our 2nd generation tool kit is made with 100% Dermatologist grade Surgical Steel to allow safe sterilization and prevent corrosion. We care about our customers and promise to provide the quality they deserve!